Zurn, Combo Roof Drain / Overflow, Cast Iron Dome, No-Hub 2 in. Out. PRODUCT: Zurn RD2130-NH2 Combination Roof Drain and Overflow Drain. Cast Iron Body and dual 6-inch CI Domes. No-Hub, 2 inch Outlet. Price/Each. Integral cast iron clamp, gravel guard, roof sump receiver. Special Options available. See product data sheet. ZURN RD2130-CI-DOME, 6 in. 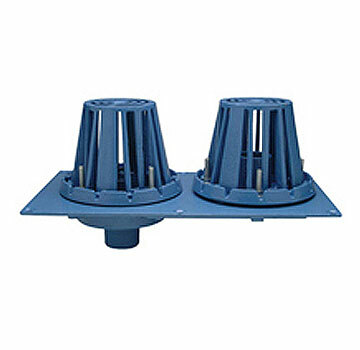 DOME STRAINER COVER, FITS RD2130 DRAIN OR OVERFLOW. DURA-COATED CAST IRON. PRICE/EACH.